From time to time we check the average cost savings that we are achieving for our invoice finance customers. 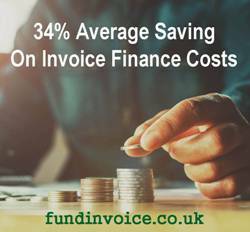 As at August 2018, over the previous 12 months, we have found average cost savings of 34% for our invoice finance customers seeking price reductions on quotes received from other invoice finance companies. We achieve these savings by being able to search the UK market of factoring, or invoice discounting companies, and beating any quotes that our customers have already received. It includes either quotes given by providers or existing rates that they are paying to their current funder. We have already undertaken a great deal of market research, including mystery shopper pricing comparisons, so we tend to know who is quoting the best factoring and invoice discounting rates. If you would like to know how much of a cost saving we can find for you it is a very easy process. We just need a few minutes of your time to gather some straightforward details. There is no obligation and you could save a lot of money. Please call Sean on 03330 113622, and he will look to beat your existing quote.